To maintain the Ingress Protection rating between the equipment and the Cable Gland, it may be necessary to fit an Entry Thread Sealing Washer at the equipment-to-gland entry interface. For installations it is equally essential to maintain the ingress protection integrity at which the equipment has been rated. The need for a sealing washer will depend on the ingress protection rating, code of protection of the equipment and the type of entry holes available within that equipment. For example, when using Ex e equipment or terminal enclosures (which are permitted to have untapped through-clearance holes) it will be necessary to fit a sealing washer to ensure the minimum IP54 requirement is met. Other equipment with tapped entry holes may not require a sealing washer to maintain the IP54 minimum rating. The CMP metric Entry Thread Sealing Washers are produced in 2mm thick white nylon as standard which are recommended and meet the specified requirements of Shell’s Offshore operations. To verify the effectiveness of the CMP nylon entry sealing washers, independent 3rd party tests to IEC 60529 have been successfully conducted on Cable Gland at IP66, IP67 and IP68 levels of protection, documentary evidence of such tests to the highest standards can be provided. 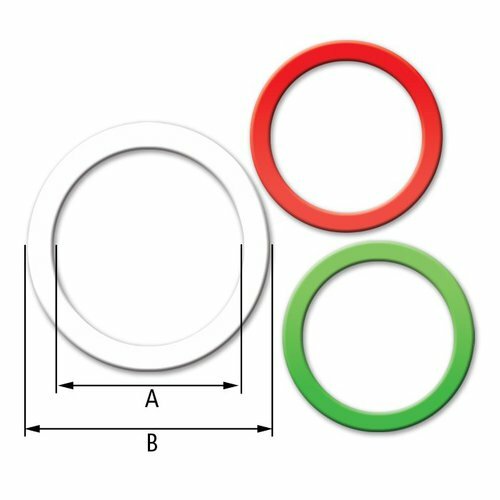 CMP NPT Entry Thread Sealing Washers are produced in 2mm thick nylon and are colour coded Green for identification purposes. All CMP Nylon Entry Thread Sealing Washers have an operating temperature range of -60°C to +150°C; for the purpose of installation, this may be restricted by, or exceeded by the operating temperature of the cable gland or cable accessory used, and care should be taken to observe the constraining temperature(s). Should the operating temperature of the CMP Nylon Entry Thread Sealing Washer not be suitable for any particular installation, please contact CMP for an alternative solution. Red Fibre Washers can also be supplied to order but careful consideration should be given to their use in sub-zero climates where absorption, freezing and cracking may occur. These red fibre washers can be ordered by substituting ‘ETS’ with ‘FW’ in the below tables. CMP also offers Cable Glands and accessories with an equipment interface ‘O’ ring seal as an alternative.